It’s a big night for Bump Technologies, the mobile software startup that recently landed a round of funding led by Sequoia Capital. The company makes mobile apps that let users share their contact information (and other data) simply by tapping their phones together. Up until now the app has been available for the iPhone only, where it’s developed quite a following, and tonight it’s launching on Android as well. The iPhone is getting some love too, as Bump’s 1.2 update was just approved by Apple (you can grab it here). The updated iPhone app includes a ‘Friend Compare’ feature that looks at the address book and Facebook profiles of you and the person you’re bumping with to see if you have any mutual friends, which can be a good way to break the ice if you’re meeting someone for the first time. The app now also includes deeper Facebook integration, allowing you to send a notification to yourself through Facebook when you bump someone (this seems like it would serve as a good reminder for following up). You can also choose to publish an item to your friends’ News Feeds when you Bump a new contact. Finally there’s the addition of a Bump history, which lets you see at a glance who, where, and when you’ve met all of your contacts (you can use filters to search through the history quickly). The Android app is still a bit behind the iPhone (it doesn’t have the features mentioned above), but it does have everything Bump 1.1 has, which includes support for both contact and photo swapping. 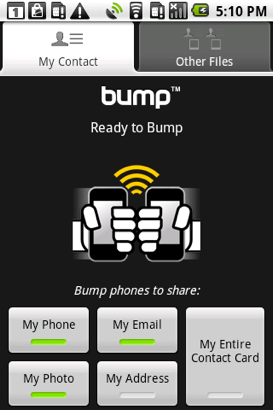 Better yet, Bump is cross-platform, which means that you can bump an Android phone with an iPhone and it should work seamlessly. 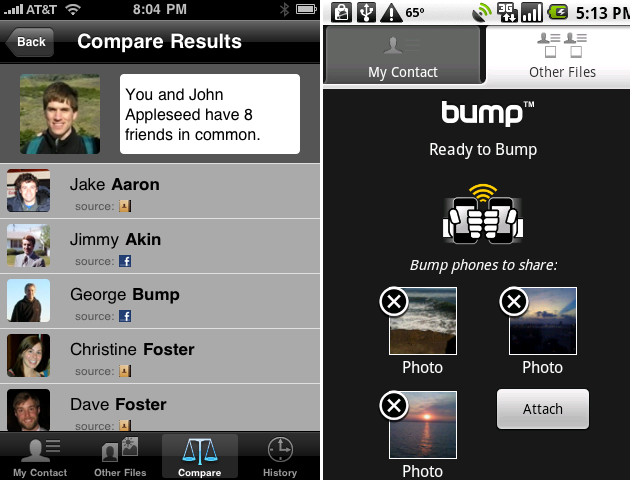 This is where the real potential of Bump lies — if the service can establish itself on more mobile platforms, it could potentially become the de facto way to swap contacts, photos, and other media between phones with next to no effort required. You can grab the new Android version here (you’ll want to visit the link from your Android phone).